Jesus occupies the primary place in Vassula’s life, along with His command to go and yield fruit everywhere! So late on Sunday evening, right after the wedding of her nephew Athanassios, her sister Yannula’s son… her mission to Asia began. After a 13-hour flight, the plane landed in Manila, Philippines. At the airport, Micaela and Aris, friends and TLIG organizers, welcomed us with love and took us to the home of the Lutz family, where we stayed for three days. This was about the amount of time we needed to recover from the jet lag caused by the time difference, which makes it difficult to adjust. On March 10, early in the morning, we departed from Manila for the first stop in Vassula’s mission to Asia, Fukuoka in Japan. 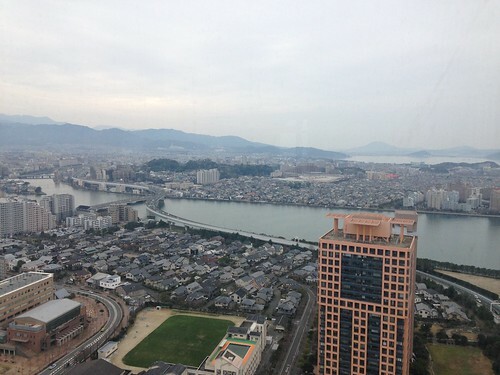 Fukuoka is the sixth largest city in Japan, with a population of 2.5 million inhabitants. 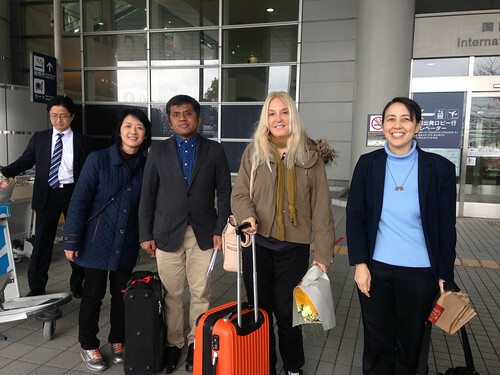 Japanese friends of TLIG travelled to Fukuoka from the other different cities of Japan to help with the organization of this two-day spiritual retreat in this city. As Vassula had been officially invited to this event, she responded warmly to the invitation and travelled once again to far-away Japan. At the airport, we were welcomed on behalf of the organizers by Nancy, along with Keiko and Fr. Imada, who were with us throughout our stay, making Vassula’s stay in Fukuoka easier. 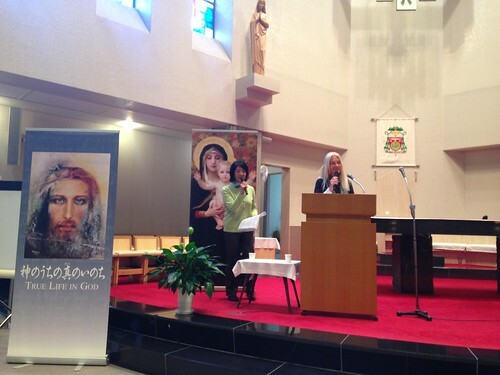 On March 11, at the Daimyo Machi Catholic Church, the two-day spiritual retreat began. 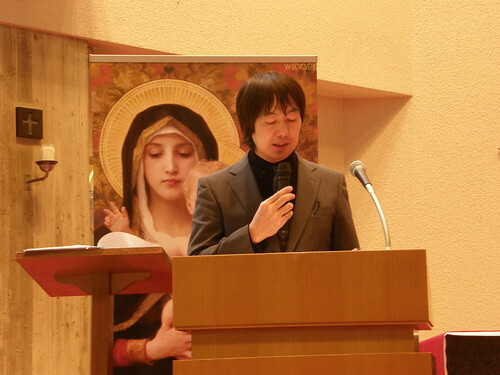 Satoru, who was responsible for TLIG communication in Tokyo, opened the TLIG retreat and welcomed those present, along with Vassula to Fukuoka, expressing his joy and gratitude to God for this blessing. He reminded participants that it was the anniversary of the day when the earthquake and tsunami took place in Japan in 2011 and asked everyone to pray for the victims. 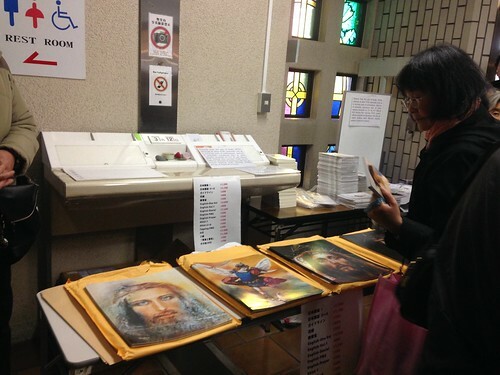 He then informed people that there are TLIG prayer groups in Japan and that those interested could fill in an application form with their details, so that they could be informed about TLIG news. 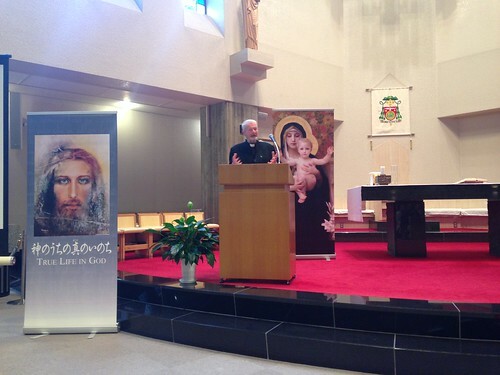 He asked participants to contribute by making a donation, at the prescribed time, during Mass, towards the expenses for this spiritual retreat. At this retreat, many people from all over Japan took part, especially from Fukuoka and Kansai. Shortly before Mass, while the priests were getting prepared, people sang praises along with a choir and Satoru played the harmonium. It was impressive to listen to the Japanese sing with beautiful voices, like a professional choir. They sang the “Ave Maria”, “Spirit of the Living God”, “Bless the Lord”, and many more hymns of praise! Mass was then celebrated and Fr. Jokiel in his sermon spoke about the gift of prophecy and people’s responses to this gift throughout the years. After Mass, Satoru led us to pray the “Stations of the Cross”, since we were in the Lenten season, according to the calendar of the Catholic Church. Shortly before Vassula’s speech at 15.00 p.m., the organizers observed a minute of silence for the tsunami victims in their country, and then their melodious voices resounded throughout the church as they sang in honor of the victims and for the glory of God. One of the most pleasant things about this retreat was that most of the participants were listening for the first time to Vassula talk about the TLIG messages! 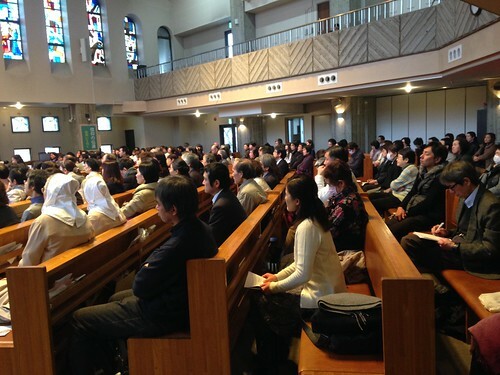 Vassula thanked the people that had filled the church, especially the priests, saying that she was very glad to be in Fukuoka on that special day. She asked those who were listening to her for the first time to raise their hands. A spontaneous “Ooooh!” came out of her mouth and she began to talk about the beginning of this revelation. Keiko was simultaneously translating from English into Japanese. Vassula spoke to the audience about the importance of our free will, which God does not want to violate; it would be our salvation if we offered our free will to Him. She reminded the people that God’s gentleness and kindness towards His creatures is unparalleled; God uses the words: “Allow Me”, saying it to Vassula, or “permit Me to use your hand”. The attendants were delighted in hearing how God is so delicate and meek with His creatures and how He lifts each of our souls filling them with hope! In her speech on the second day of the retreat, after she had noticed that there would be a long wait for confession, Vassula discussed the manner in which it should be done. She stressed out that when we go to confession we should do it right. We should confess our sins to the priest. We are not there to justify ourselves, insinuating that we are the victim and that it is others who are to blame. Confession is neither a place nor the time to tell our life story or our problems to the priest. Confession is a time and place to pin-point our sins, what our conscious says we did wrong, and after having recognized our guilt and sin we ask to be forgiven. She then shared with us a few stories from the first three years of the secret teaching she received from Jesus Christ; no one had as yet heard about this revelation. “Allow Me to form you the way I want you to be…” After three years in Bangladesh and seventeen years in Africa, she said that in these developing countries, her Angel Daniel prophesied to her that she would be sent by God to Switzerland, to spread the seeds of the TLIG Messages from there. She spoke about her first speech and the grace that she felt when and after she spoke, filling her body like a warm liquid, which obviously was the Holy spirit providing her with confidence and the certainty that Jesus would give her the words to enable her to testify about God’s Love, His Tenderness, and His Mercy. She spoke about her ignorance and the way she used to talk to Jesus Christ, citing a conversation she had: “Jesus: Peace be with you. Vassula: And also with You…” She said that when Jesus began to teach her, He would never come with the authority of a professor, but with the simplicity of Wisdom. She explained the meaning of “We-us”; she spoke about the Mother of God, Our Lady, about God the Father, and stressed that simplicity of heart is the way in which we should address God. 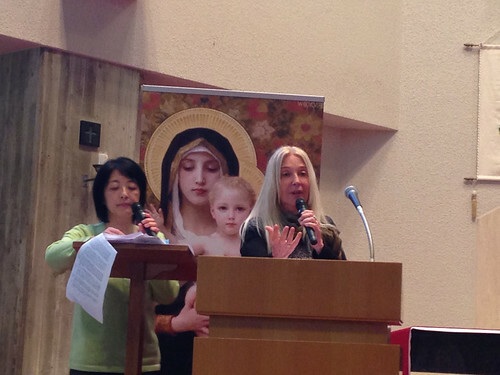 Of course, she also spoke about the power of the Rosary Prayer. Vassula’s testimony was a reminder of the Word of Christ, a reminder of God’s Love and His promise that He will guide us till the end, if we remain faithful to Him and His commandments! After her speech, Vassula explained the process of the Healing Prayer that would follow, as well as the action of the Holy Spirit. She explained that people are often slain in the Spirit: the blessings and healings that take place when we invoke the Holy Spirit with faith. The organization of the spiritual retreat in Fukuoka was excellent, perhaps one of the best I have seen, as I have accompanied Vassula on many of her trips in recent years. 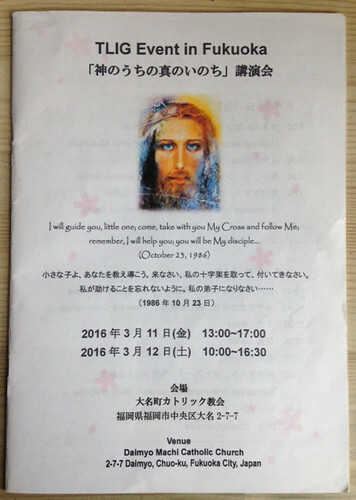 The organizers gave all participants a booklet which outlined the daily church services, the readings and the songs in Japanese and English. 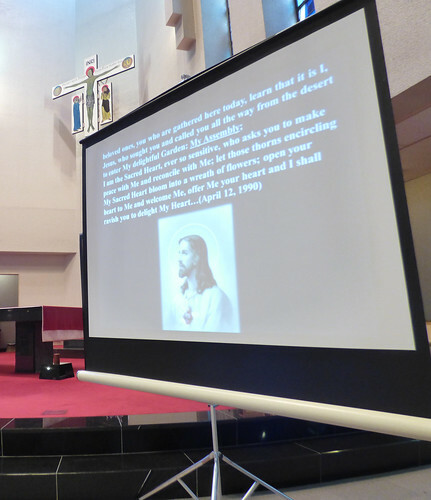 Simultaneously, Shery was translating the speeches on her computer from Japanese into English, and the Mass, the sermon, as well as all that followed as part of the schedule. The translation was projected onto a big screen. So Vassula and I, even though we do not speak a word of Japanese, could attend and participate in the whole program, knowing at any time what was going on and what was next! Later on, we had the opportunity to speak with some of the people who attended the spiritual retreat. We admired yet again, the way in which the Lord approaches each soul. 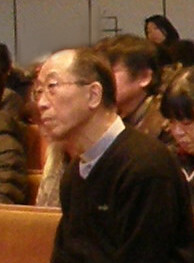 A Japanese friend, who had been seeking God, began to read the Bible. One day, he visited the library in his town, where he found the 1st volume of the TLIG messages in Japanese. When he read them, he was impressed by the similarity of the book to the Holy Scriptures. He then he heard that Vassula would speak in Yokohama. 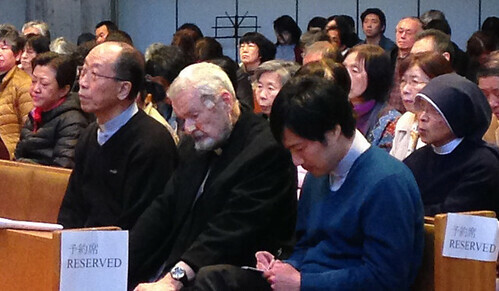 This was the beginning… his participation in the Fukuoka retreat followed. Jesus had lit the flame of faith in his soul. 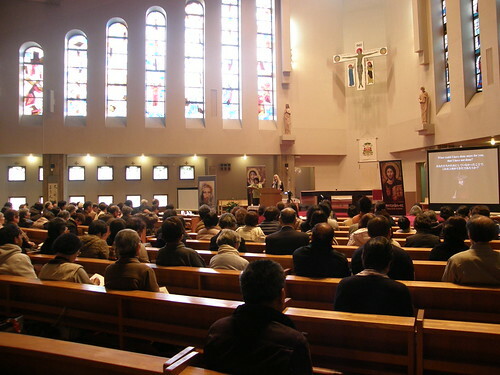 Vassula thanked the organizers, as well as the roughly 300 people who attended the two-day spiritual retreat in Fukuoka. 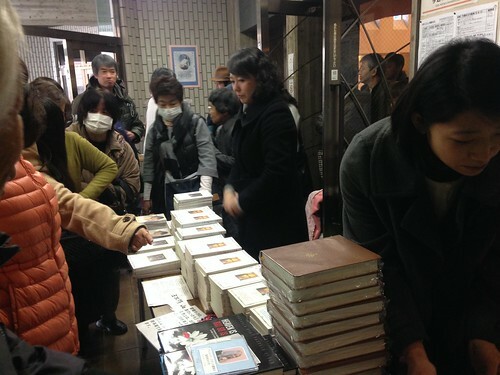 The TLIG books, translated into Japanese, soon disappeared from the counters as they were very popular. On the last evening, we said goodbye to the friends who came to Fukuoka from many different Japanese cities in order to help with the organization of this retreat: Satoru, Keiko, Sheri, Nancy, the priests… and so many others whose names I do not know. The mission to Japan had been completed. The meeting in Fukuoka concluded with the hope that the people who participated and derived spiritual benefit would go on to create prayer groups and spread the TLIG messages to others. The Holy Spirit will continue His work. Glory and honor belong to our Heavenly Father forever and ever.